The debris cart will continue to be emptied every other week. Albany residents worried about a proposal to increase the frequency of yard debris pickups in Albany can stop worrying. The city council made it clear Wednesday it does not think much of the change and will not act to authorize it. Republic Services has the franchise to provide trash disposal and recycling services in the city. 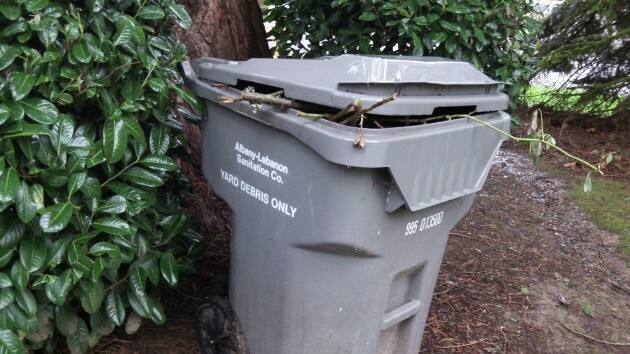 On Monday the company went to the council with the results of a company-sponsored email survey on increasing yard debris pickups from every other week to weekly, which would also allow people to dispose of food waste with the yard debris for recycling into compost. About one-fifth of Republic’s Albany customers with email addresses responded, and of those, more than half supported a weekly yard debris program that incuded food scraps. The company told the council the added pickups would raise the price of trash disposal $3 per month for all customers — to $31.81 a month for the large trash carts and $21.31 for the smaller kind — something the survey did not mention. The proposal prompted a good deal of opposition on this website and, the mayor said, the Facebook page of the Albany Democrat-Herald. Among the points raised: Why pay more for weekly pickups when in winter it’s not needed for yard debris. If people have more yard clippings than their cart can handle every other week, they can pay for getting an additional cart. What about the extra chore of storing food scraps separately in the kitchen before taking them out to the yard debris container, or are people supposed to walk outside after every meal? And why deprive the Coffin Butte landfill of food waste, which in decomposing helps produce electricity at the dump. The council heard from Bill Root, who lives on Valley View in North Albany, urging support for the added service and the price increase. He said trash service is the least costly of his utility expenses. But the council was unpersuaded. “Not at this time,” said Mayor Sharon Konopa, implying a future opportunity may still exist. Given this issue has now surfaced twice in the past two years, I think it’s safe to say it will come up again in the near future. We can only hope a future council will reject it as fast as this council did. I live in North Albany and Bill Root does not speak for me or my interests. Thank you Council for seeing thru the revenue increasing plan of Republic to charge us more for a service we don’t want or need. I guess we can make a difference at times! I doubt it. The council was genuinely unimpressed with charging more for weekly debris pickup and the recycling of food waste.